This page contains news and events of the Upper Hudson Library System. To see news and events of the member libraries, please go directly to the libraries' web sites. Under the supervision of the Library Director, the Library Associate performs responsible and varied clerical library services in the circulation of library materials, performs clerical-administrative work, assists patrons in using library services and facilities, and assists with library programs. Hours: Works a schedule that includes Fridays, Saturdays and some Thursdays. East Greenbush Community Library seeking enthusiastic and engaging Summer Reading Assistant! Will assist youth services librarians with implementation of bustling summer reading program (800+ children and teens) from the end of June until mid-August. The summer reading program provides literacy-based activities for youth with various events for all ages. Tasks performed will include set up and take down of daily programs, preparation of materials required for events, and helping children during activities. Will also assist with teen volunteer management, maintaining book displays, and other duties as assigned. Programs take place both indoors and outdoors! General Qualifications: Friendly, outgoing person with strong organizational skills and ability to work independently. Experience working with children and teens is highly desirable, preference given to applicants with library experience. A minimum education of a bachelors degree is preferred. Schedule: 15-20 hours per week. Typical schedule is Mondays from 12-5pm, Wednesdays from 2:30-8pm, and Thursdays from 12:30-8:30pm, with some variation for special events. Salary: $16.50 per hour. This is a temporary seasonal position. We will begin reviewing applications on April 8th. Whether you work with adults, youth or anyone who walks in the door, serving the public requires a high level skillset. Please join us for this helpful workshop! Under the supervision of the Library Director, the Library Associate performs responsible and varied clerical library services in the circulation of library materials, performs clerical-administrative work, assists patrons in using library services and facilities, and assists with library programs. The Library Associate works as a team player with other associates. Hours: Works a schedule that includes days, evenings and Saturdays. Experienced library worker needing extra money? Gain valuable experience in all aspects of running the circulation and reference department several Saturdays a month. Opportunity for more hours as a substitute for both scheduled and sick leave replacement. Can gain experience in designing and running events, creating displays, innovation in service and procedures, and outreach to the community. Part-time bookkeeper with proficiency in QuickBooks and other commonly used accounting tools. Applicant should have a minimum of two years of experience with QuickBooks and be familiar with fund accounting, budgeting and the workings of a 501(c)3 not-for-profit organization. Knowledge of public library operations a plus. Approximately 3-4 hours per week for duties such as regular billing, preparation of materials for board meetings and attendance (as requested) at library committee and board meetings, and annual budget planning sessions. Please send resume, three references and required hourly wage by October 19, 2018 to the attention of Library Board President Christine Carpenter via email to altm_search@uhls.org or via USPS to Altamont Free Library, P.O. Box 662, Altamont, NY 12009. We've got a brand new way to access library resources! Public libraries in Albany & Rensselaer counties now offer an app called UHLS Mobile, available for free in both Android and Apple app stores. The app features include the ability to search the UHLS catalog; check the status of a library card account; place physical items (such as books, CDs and DVDs) on hold so they can be picked up at the library; discover and access digitally distributed items like ebooks, audiobooks, and digital magazines; and connect users to other information such as library hours and program calendars. The app even can scan the ISBN barcode of any book to see whether our libraries own a copy of a specific titleand place a request for that book right away. Download UHLS Mobile today and take us with you wherever you go this summer! 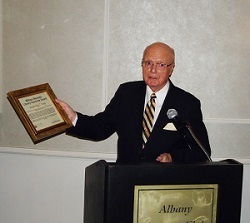 NYS Senator Hugh T. Farley receives the 2017 William Meredith Advocate Award for his extraordinary efforts on behalf of New Yorks libraries. As the creative force behind THREE successful STEM-themed youth programs offered at the library, Alan has devoted countless hours to the library. He developed the Cyber Kids program which teaches coding skills to elementary students. This very popular program has been offered multiple times in the last three years and has graduated 80 kids to date. He created a Teen Techies program for the library that provides teen tech assistance for older adults and has recruited and trained a group teen helpers to insure sustainability of the program. Earlier this year Alan planned and presented a website design program for tweens as a Spring Break program at the library. And all of this was accomplished before he graduated high school!! all in the span of four years! This multi-part program series began with a reading and discussion group at the library co-facilitated by a librarian and a local Imam. The group read and talked about the experiences of Muslims in contemporary American society and sought to foster a broader understanding and a mutual respect among people of different cultures in the Troy community. The second phase of the program was a series of presentations delving into the basic tenants of Islam; a brief history of the religion; and an examination of Islam in the modern world. The capstone session was a visit to a local mosque to observe a prayer service and to participate in a roundtable discussion with members of the Muslim community. all to create robots that danced! Each participant started with a robotic kit purchased with Legislative grant from Assembly Member Pat Fahy, to build their Beat Bot. Once completed, the teens choreographed dance routines to perform with their Bot. The dance routines were then performed at several public events, allowing the teen designer/dancers to show what they learned about science and about their dance moves! In addition to a framed certificate, each award winner received a cash award for their home library to help support future community building efforts. We are very pleased to be able recognize the wonderful things happening in our libraries. They are all making a real and positive difference in their communities every day, said UHLS Executive Director Tim Burke. 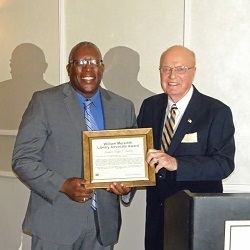 Antonio Booth, RCS Community Library Board President, presents recently retired NYS Senator Hugh T. Farley with the 2017 William Meredith Advocate Award for his extraordinary efforts on behalf of New Yorks libraries. Along with the awards, the UHLS Board of Trustees recognized the long and dedicated service of two of its trustees. LouAnne Lundgren of Poestenkill is stepping down from the Board after 14 years of service representing small libraries in Rensselaer County. Philip Erlich of Rensselaer is leaving the Board after 23 years of service representing medium size libraries in Rensselaer County. Both were presented with a resolution of appreciation from the UHLS Board and were named UHLS Trustee Emeriti. For more information about the award winners, the Upper Hudson Library System, and the important work done by all of the public libraries in Albany and Rensselaer Counties, please contact Tim Burke at (518) 437-9880 x222 or tim.burke@uhls.lib.ny.us. Childrens, tween, and teen programs in UHLS libraries are now more accessible than ever! Libraries in Upper Hudson Library System have pooled their programs in one program calendar, available at http://events-ys.uhls.org/. Users can search by date, location, or age categories. Public libraries offer scores of activities during summer months to interest kids and teens in reading and help them combat summer learning loss. Kids who dont read much over the summer can lose significant skills and return to school behind their peers. The joint program calendar makes finding a fun, free library event in UHLS libraries for children easy for parents. Access the joint youth services program calendar here. See a list of local public libraries here. More about summer learning loss and libraries here. UHLS is pleased to announce that our new CORE Trustee Training program is now available for all member library trustees. This program is a 90 minute session that covers the fundamentals of being a library trustee, including roles and responsibilities, NYS minimum library standards, oaths of office, open meetings law, board/director roles, etc. The program also emphasizes the CORE values of Community, Openness, Respect, and Ethics as they relate to the work of a library trustee. This program is valuable for all currently serving library trustees regardless of their tenure on their board. There is real added value from having all of a library's trustees share the experience together (common ground understanding of these fundamentals, encouraging mentoring of newer trustees by the "old hands", etc.). UHLS also recommends that the Library Director be included when a member library hosts the program to encourage that same common ground understanding between the Library Board and the Director. The CORE Trustee Training has been designed to be an "on demand" program that can be conducted at member libraries at a date and time that is most convenient for trustees to come together. Please contact Tim Burke (e-mail - tim.burke@uhls.lib.ny.us or phone - (518) 437-9880 x222) to arrange a session for your library board.